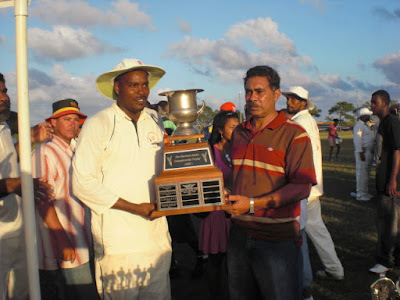 (L) CAPTAIN LAWRENCE BANNER, "MAN OF THE MATCH"
Crooked Tree Village is now home to the Belize Rural Cricket Championship Trophy for the third year in a row. 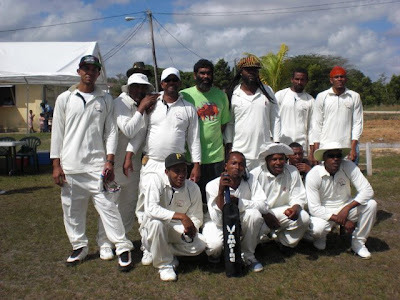 Brilliant, by virtue of their unbelievable, inconceivable defeat of Excellence of Double Head Cabbage, have now won Belize Rural Cricket Championship, with a sensational blow out at Lords Bank Cricket Field 135 to 93. What more could you ask from cricket’s champions of champions. The game started with disappointments as Brilliant of Crooked Tree opted to bat first and the wickets started falling like ripe mangoes from a tree. Brilliant at one time, struggling to score 50 runs; with 46 for 8, Crooked Tree then moved to 58 for 9. A spectacular performance by Lawrence Banner and Varon “Mun” Westby, Crooked Tree surprised the cheering fans and ended up with 135 all out with “man of the match” Lawrence Banner batting 61 not out. When it was Excellence of Double Head Cabbage turn to bat, Crooked Tree changed 4 bowlers before the 16th over, when Double Head had their first man out with 43 runs on the score board. Exceptional bowling by Brandon “FUD” Lewis made Crooked Tree rebounded and in the end dismissed Double Head for 93. Crooked Tree fans then swarmed the Lord’s Bank Field celebrating in victory. Each of Brilliant’s star players were discovered off the streets in Crooked Tree Village. They do not receive any salary, and struggle to practice and take care of their families. Somehow, this group of dedicated rag tag players, continue to win year after year. 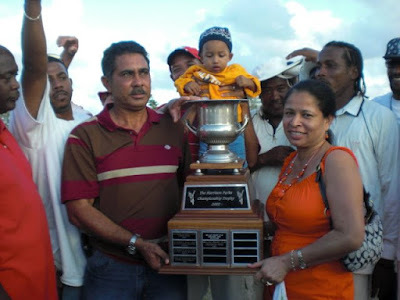 In these economic hard times in Belize and around the world, how can you not feel proud that it’s Brilliant who has become the model for cricket in all of Belize? Teams and players have come and gone, but the brilliance of Brilliant just keeps on coming. They have been sponsored by Eustace"Tes" Dawson for many years, and we say well done to Tes. They repeatedly win without the big time backers and the arrogant knuckleheads that dominate much of professional sports all over the world. The Brilliant Cricket Team should be celebrated! Can you not love the brilliance built on pride, passion and their adoring fans? SQUAD: Lawrence Banner (Captain), Lyle Tillett, Arthuro Wade, Landis “Ciego” Wade, Brandon Lewis, Heckland Adolphus, Varon “Mun” Westby, Rodwell Cornique, Eldon Wade, Germaine Smith and Shane Westby. Coach and owner, Dawson is a good example of hard work and dedication. He became coach at a time when Brilliant was in a period of decline, some 13 years ago. A special trophy presentation ceremony will be held later this month in Crooked Tree Village. The presentation will be followed by a marathon match featuring the "Champs" and other teams from the division. Coach Dawson said that it’s getting very expensive to run the team. They are hoping to get more sponsors for their games and that will help to promote and spread the game of cricket. Hi Linda, My first time reading and browsing your Website, very impressive,so much information. I love the fact that you have information on Belize and our beautiful Village Crooked Tree (MY HOME). I love the information on foreign affairs, I know how passionate you are about Israel, the fact that you lived there for so many years. I am very proud of you, keep up the good work. Keep writing I will keep on reading. Thanks for your hard work and involvement in reminding us of Belize and not to mention our beautiful Crooked Tree Village. I look forward to your newsletter. Nice, very nice, you continue to amaze me with all you do for the Village.. congrats.. its good stuff.. take good care. Linda this is good stuff, excellent. Thank you; you made my day! Way to go, Brilliant! Go, Brilliant, GO!! Hi Linda, Even though I read about this on the Belize news I must say that your article is more entertaining an interesting than any other news source. You have written so many good articles on this blog and you have taken the time to go further with your research to make it easier to get the real insight about what's happening especially with the sugar cane strike. The news doesn't explain as you do. So keep it coming. I must add my congratulations to Tes and our BRILLANT TEAM. Way to goooooo. Hi Linda, I continue to read your blog and found your articles to be well written. I especially like the way you keep us updated about Crooked Tree, our hometown. Growing up in CT, I remember going to a lot of Brilliant Cricket Games. I'm very proud of you, keep up the good job sis. Very good blog girl. Keep up the good work. If everyone could work together with you and show some love and stop all the hating, we would have a very good Village. Hi Linda, I really like you new Website VillageViewPost.com. The picture of the lagoon is so beautiful; it is such a beautiful view. Looking at it makes me so home sick. Keep up the good work, and keep posting more pictures of our beautiful Crooked Tree Village. Lastly,I would also like to congratulate "Brilliant" on winning the competition. Hey everybody!I'm glad you liked the story on "Brilliant Cricket Club" All I care about is helping and bringing you stories about our Crooked Tree Village community. Your comments are so great! Thanks for stopping by my blog, it’s great to have you! I always thought that our Crooked Tree Cricket team is brillant. This success just proved it.